Well, aren’t you looking pleased with yourself? You have in your midst a motivated, excited new hire that looks like all his Christmases have come at once. You hired well, my friend. And you worked hard to welcome him into your company so that he knew from day one that he had made a great decision. It feels great to have a new hire that you know is going to smash it. And throughout this series of ‘Seven Faces of Your New Hire’, we have looked at how it can go wrong. Oh, and it can go horribly wrong. So, in this final post of the series, let’s celebrate when it goes right. We spend a lot of time dwelling on things that have not gone so well. But we don’t spend enough time reviewing what went well so we can repeat it. Why is your new hire so excited? You took great care in your hiring process. You really thought about what you wanted from your new hire. Not only in terms of experience but also behaviour and personality. You were honest about what the job was like at interview. You let them spend some time, without you there, with someone in the team to hear more about it. You had a plan. You had spent some time planning on how to get him up to speed on his job and tried to keep it interesting and varied. You focused on ‘team’. You found ways to help him get to know his fellow team mates and recognised the importance of this support network for him. You planned his first day so that he was bursting with enthusiasm when he told his family about it over dinner that night. You told him what you wanted. You sat down and talked about what you expected of him in the first few months. He understood what success looked like for you, and how you would help him get there. You recognised the importance of ‘Why’ as well as ‘What’ and ‘How’. So your new hire now understands why his role is important to the organisation and what he can do to make it more successful. You helped him build his network. You set up meetings so that he could meet the key people from the departments he will be interacting with. By doing this, you helped him start building that all important network that will be vital to his success. You found time in your schedule to meet with him regularly to answer any questions. You made him feel valued. 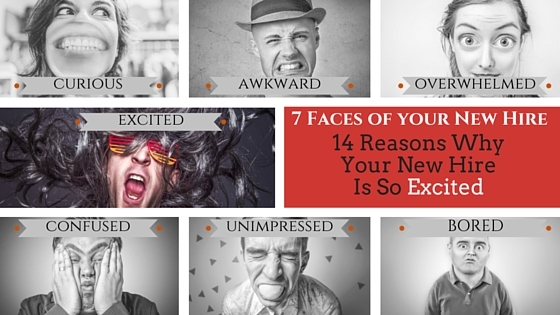 In a nutshell, do you know the reason your new hire is excited about being here? It is because you realise that your people are your number one asset. You treat them with respect. You give them the authority they need to do their job well. And you have their back. But don’t despair if you are not feeling the excitement bubbling out of your new hires yet. And I am giving it to you completely free by simply clicking here. Yes, your free guide to creating an awesome onboarding plan that you can use for all your new hires coming in is just one click away.